Are time travels possible? Well, I believe they are, at least in our mind. A picture, a sentence, a smell and you are suddenly somewhere else, a few years back, undergoing a certain situation once again. These sudden recalls are sometimes nice, sometimes awful and sometimes just funny. 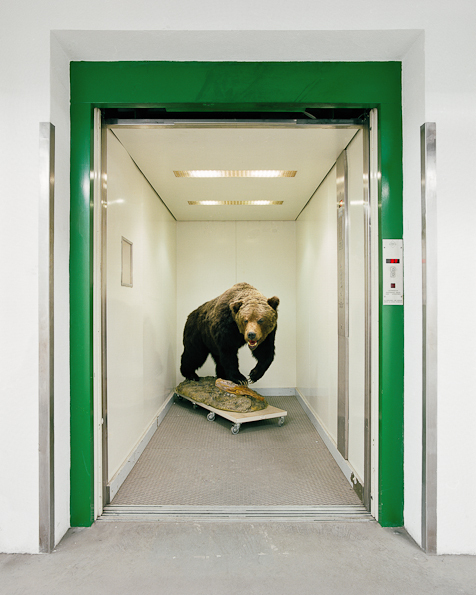 The last time it happened to me was when I first saw the bear in the elevator from the “Skeletons in the Closet” project by Klaus Pichler (see his article “On tour with Noah’s helpers” for more details). I was visiting some former colleagues at the Landesmuseum für Technik und Arbeit short before the opening of the exhibition “Kosmos im Kopf” (the cosmos in the head). I pressed the button at the staff elevator and waited for it to arrive. The door opened and I suddenly jumped backwards. A gigantic Great Dane stood before me, staring at me, jar slightly open. For a moment I considered this a rather ridiculous but somehow adequate way to die for a museologist, but then I thought again. It was not logical that a man-eating dog would use the elevator to search for its next prey. After the first shock I looked closer and discovered that the Great Dane was just stuffed. Apparently, the dog was “parked” in the elevator until the preparators would need it. I decided to join the dog in the elevator and it reminded me of another occasion a few years earlier. I had just started studying museum studies and was still trying to make up my mind which path I wanted to chose in the field. So I took an internship at the Naturkundlichen Sammlungen (Collections of Natural History) in Berlin-Charlottenburg. In the workshop of their taxidermist stood a stuffed wolf that looked so realistic one had to touch it to be sure it wasn’t alive. Their taxidermist was a real artist. He explained to me how he “stuffed” animals (a term he used to distinguish ordinary “stuffers” from real taxidermists who learned and studied the trade). Before he did anything with the dead animal, he tried to get a picture of the animal when it was alive. A picture in the most comprehensive meaning of the word: he tried to get pictures, videos, tried to talk to people who knew it when it was alive and so on. He explained that if you don’t do this, you just prepare an animal that is one of its species. If you want to do a taxidermy of a certain animal, only this unique animal, then you have to know its personality otherwise no-one will recognize it when it’s ready. And this is true. Try it yourself when you are visiting a museum of natural history the next time. I promise you that you will spot animals that look just “right”, nearly alive. And there will be some that look just “wrong” although they are anatomically correct (you will find some that aren’t even that – but that’s a different story). Since this internship I have a great respect for the job the taxidermists do – and I discovered that I will never have the patience to be one myself. Book: ‘Skeletons in the Closet’, photos by Klaus Pichler, texts by Klaus Pichler, Julia Edthofer and Herbert Justnik, english edition, is out now and can be ordered via the homepage of Klaus Pichler.